Famous Telephone Supply Company is a leading wholesale distributor of voice and data communication products primarily to contractors and end-users in commercial, residential, industrial, and institutional markets. Melcap Partners acted as the sell-side advisor for Famous Telephone Supply Company. 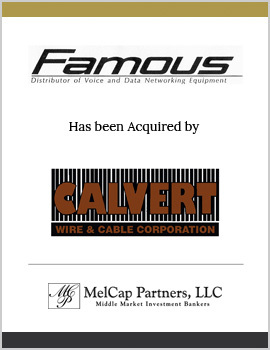 Famous Telephone was sold by its parent, Famous Industries, to Calvert Wire & Cable Corporation, a leading full-service provider of a complete range of cable and connectivity products.